If you provide services to kids, pregnant women & newborns, uninsured women, and families who get their health care services through MO HealthNet, you can provide services through the MO HealthNet Managed Care Program. MO HealthNet Managed Care services are provided in accordance with the terms and conditions of the contract between MO HealthNet and the Managed Care health plans. Managed Care participants get their services through the health plan's provider network. A participant cannot be billed for the difference between the MO HealthNet payment and the provider's billed charges, sometimes called "budget billing." If you would like to contract with a Managed Care health plans you should contact the health plan directly. You will need to sign a contract with them to be considered in network for that health plan. Providers are not currently required to enroll with MO HealthNet to serve members through the Managed Care health plans but are encouraged to do so. Listed below are the different MO HealthNet Managed Care health plans participants can choose from. Each health plan provides services in every Missouri County. All MO HealthNet Managed Care health plans are required to offer the same services and benefits. Training information Offers provider webinar and workshop schedules, audio/visual trainings, and training booklets. 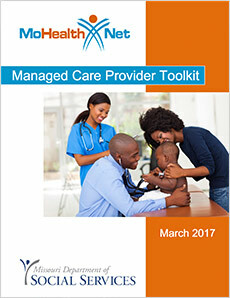 Provider Resource Guide (formerly Puzzled by Terminology) This guide explains the various MO HealthNet terms and codes. Benefit Tables (formerly Benefit Matrix) This shows the various benefits for each MO HealthNet programs, and if they have cost sharing or co-pays.